Fat malabsorption, acne, high cholesterol, eczema, psoriasis, asthma, allergies, gallstones, food intolerance, shoulder pain, abdominal pain, upper back pain, arm pain, liver or gallbladder pain, hypertension, cardiovascular diseases, heartburn, bloating, inflammatory bowel disease IBD, IBS, colitis, constipation, cancer, AIDS, MS, FMS, MSC, CFIDS/CFS, Parkinson's, Alzheimer's disease, epilepsy, seizures, osteoporosis, angina pectoris, and more. For an effective liver cleanse, you should first do (1) a parasite cleanse and (2) a kidney cleanse - cleansing a liver with living parasites in it could make you feel quite sick. Choose a day like Saturday for the cleanse - you will be able to rest the next day. Take no medicines, vitamins or pills you can do without - could prevent success. Eat a no-fat breakfast and lunch -allows the bile to build up and develop pressure in the liver. Higher pressure gives a better flush. ✔ 1 large or 2 small grapefruit OR 3 lemons - enough to squeeze 2/3 to 3/4 cup juice. ✔ Do not eat or drink after 2 O'clock - or you could feel quite ill later. ✔ Mix 4 Tbsp. Epsom salts in 3 Cups freshly made grapefruit or apple juice. ✔ Drink FIRST 3/4 cup dose of the ice cold Epsom salts - after adding 1/8 tsp. powdered vitamin C to improve the taste. You may drink a few mouthfuls of water afterwards or just rinse your mouth. ✔ Drink SECOND 3/4 cup dose of Epsom salts -You haven't eaten since o'clock, but you won't feel hungry. ✔ Get your bedtime chores done - the timing is critical or success; don't be more than 10 minutes early or late. ✔ Mix olive oil and grapefruit juice - Pour 1/2 cup olive oil into the pint jar and squeeze the grapefruit or lemon juice into a measuring cup - remove pulp with fork; you should have 2/3 - 3/4 cup total (you may top it up with lemonade). ✔ Add grapefruit juice to oil in jar (If using lemon juice, do not blend juice with oil, it can congeal and become slimy). ✔ Close the jar tightly with the lid and shake hard until watery - only fresh grapefruit does this. ✔ Now visit the bathroom one or more times - even it makes you late for your ten O'clock drink. Don't be more than 15 minutes late. ✔ Drink the olive oil / grapefruit mixture - Drinking through a large plastic straw helps it go down easier, since it does not taste great! Take it to your bedside if you want, but drink it standing up. Get it down within 5 minutes (15 minutes for very elderly or weak persons). ✔ If using lemon juice - drink a little oil, then a little juice, from 2 different cups. ✔ You can take 4 ornithine capsules with the first sips - to make sure you will sleep through the night. Take 8 if you already suffer from insomnia. ✔ Lie down immediately - The sooner you lie down the more stones you will get out. Be ready for bed ahead of time. Don't clean up the kitchen. As soon as the drink is finished, lie on your right side for 15 minutes with your right knee pulled up to your chest (helps open the pathway to gall bladder, but can cause some nausea). You may feel a train of stones traveling along the bile ducts like marbles. There is no pain because the bile duct valves are open (thanks to the Epsom salts!). ✔ Take your THIRD 3/4 cup dose of Epsom salts - If you have indigestion or nausea wait until it is gone before drinking the Epsom salts. You may go back to bed. ✔ Take your FOURTH (and last) 3/4 cup dose of Epsom salts -You may go back to bed. ✔ You may now eat - Start with fresh fruit juice. Half an hour later eat fruit. One hour later you may eat regular food but keep it light. By supper you should feel recovered. 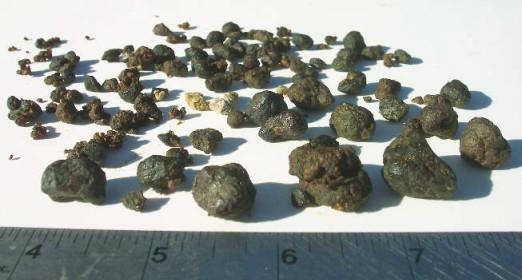 Expect diarrhea in the morning - although you may see what looks like large stones, they are instead, bile precipitated into solids during the night of the liver flush. It is not important that you see or count "stones", since most are like small grains of sand. What is important is that you see an improvement in your gallbladder symptoms and general well-being. Sometimes, the bile ducts are full of cholesterol crystals that did not form into round stones. They appear as "chaff" floating on top of the toilet bowl water. It may be tan colored, harboring millions of tiny white crystals. Cleansing this chaff is just as important as purging the stones. Cleanse is safe even for persons in their seventies and eighties - however it can make you feel quite ill for one or two days afterwards, especially if the maintenance parasite program has been neglected.